Berlin, 30 April, 2018. A packed #gamesweekberlin came to an end on Sunday evening with the staging of the Games and Playful Media Festival A MAZE./Berlin. Over the course of seven days from 23 – 29 April, around 15,000 visitors attended more than 12 individual events under the auspices of Europe’s leading communication and networking platform for innovative technologies, business trends and digital games culture. Professional delegates and gamers alike got their money’s worth. The week kicked off with the Opening Gala in Säälchen, the official #gamesweekberlin base, which hosted many of the other events. Around 300 guests came to the opening where the newly created MEDIENPREIS GAMES was presented in four categories to recognise quality journalism in the reporting on games: Best REVIEW for „Seekrank im Büro“ by Jan Bojaryn, Best TEXT for „Ork hinter Gittern“ by Hannah Knuth, Best VIDEO for „Ultraviolence & häusliche Gewalt: Sonys thematisches Schleudertrauma“ by Robin Schweiger, and Best AUDIO for „Die Evolution von Thumper“ by Daniel Ziegener. The Game and Playful Media-Festival A MAZE./ Berlin and the Gamefest were extremely popular with the public at the #gamesweekberlin. On the occasion of its 10th anniversary, the A MAZE./Berlin again offered a unique interactive exhibition with 100 installations, concerts, talks, workshops and the presentation of the A MAZE Awards at the Urban Spree space. These are the winners: Most Amazing Game Award: Attentat 1942 (CZ) – Charles University / Czech Academy of Sciences; Long Feature Award: Norwood Suite (US) – Cosmo D; Collider Award: Fountain (DE) – Philipp Stollenmayer; Digital Moment Award: Genital Jousting (SA) – Freelives; Human Human Machine: Tuned Out (US) – Shallow Games; Audience Award: Wobble Garden (DE) – Robin Baumgarden; and Humble New Talent Award: Bahiyya Khan (SA). 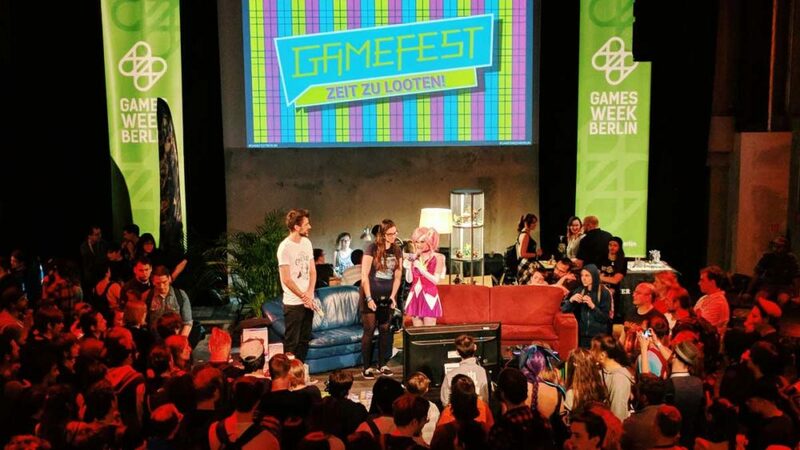 The Gamefest Berlin turned out to be a crowdpuller. Numerous gamers, families and enthusiastic cosplayers came to the exhibition in Säälchen and played entertaining local multiplayer games, creative indie titles, virtual reality, augmented reality and tabletop games as well as retro games from the Computer Games Museum and René Meyer’s private collection. The stage show provided a diverse programme of entertainment, including tournaments, couch gaming, discussions and interviews. The fans stood patiently in line to meet and take photos of the two cosplay stars Zayuri (as Star Guardian Lux) and Maul Cosplay (as Geralt von Riva). The action programme WOMENIZE! for women in the games and tech sector was held over two days this year. The organiser Booster Space supported the call for more gender diversity in the games and tech sector through a programme of workshops and inspiring lectures. Successfully established events of the #gamesweekberlin such as the game developer conference QUO VADIS – Create.Game.Business, the Matchmaking Dinner, the APITs Day, Womenize!, the Gamefest and the Berlin Games Breakfast, were joined this year by the Opening Gala, including the MEDIENPREIS GAMES, the Unreal Fest Europe, the first German Esports Summit, and the Seitenquiz and the city-wide live-action roleplaying game The Wall 2061 as partner events of the Gamefest. The official party was hosted by the newly founded Berlin chapter of the IGDA (International Game Developer Association). The Medienboard Berlin-Brandenburg backed the #gamesweekberlin and several of its individual events: A MAZE./Berlin, Gamefest, Opening Gala, QUO VADIS, WOENIZE!, Matchmaking Dinner, German Esports Summit.